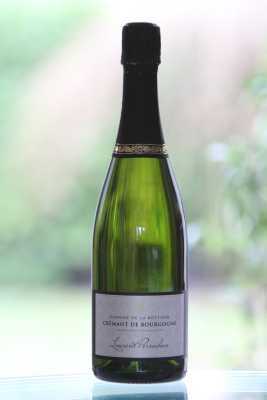 Since 2012 Laurent Perrachon is offering a Crémant de Bourgogne "Blanc de Blanc", which means that it is made exclusively with the juice of white grapes. Laurent has selected a portion of his Chardonnay vineyard for this wine. He makes the first "cuvée" himself in the cellars of the Domaine de la Bottière from grapes harvested in 2011. He uses all his expertise to build the wine structure: its body, its acidity, its refined palate. He then trusts this wine to an elaborator, who will take care of the second fermenting, in the bottle this time. This fermentation lasts at least 9 months. You will find all the subtlety of the Chardonnay in this Crémant Blanc de Blanc. Bold, fresh nose, subtle palate with flowery notes, slightly lemony. Hand picked grapes in holed baskets, making sure the berries are preserved whole. Drink within a year or two to preserve its freshness.